In artist's creation, the relationship between the ambiental and the sculptural, even the monumental, is plurivalent. A common denominator and binder among the possible framings is a discretion converted 100% in refinement. Both fragile and strong, the exhibited works are able to make the space live – and everything follows implicit aesthetic means. 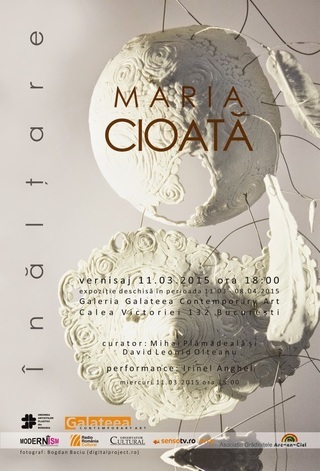 Flight and Ascension, the reference points of the exhibitional project, demonstrate – though the fact is not a stake – that Maria Cioată implements her ideas in a logical and natural way. Making up a complex installation, the works have been conceived so that they should emit sounds. The evoked semantron silhouettes, yet the angel wings, which seemed to shake their feathers, the suspended strings alluding the celestial harps, were waiting for the music to start. During the opening event, composer Irinel Anghel interpreted a performance in which the gesture, music and ceramics achieved an original multimedia chapter. The numerous public attending the event perceived the works as multiplying and developing into new shapes, filling the space and showing, again and again, artefacts' power to transfigure and transcend.